The webinar came at a good time, too: Last week Google announced it was including key Scorecard data for certain searches about a university or college. Here’s the internet giant with more. This discussion, a recording of which appears on this page, includes important tips and shortcuts to help you get started reviewing crucial digits about the colleges you cover, such as skipping past hundreds of variables you don’t need to focus on the few you do. Example: “rpy_3yr_rt” stands for the three-year repayment rate for past students of that institution. Ben Miller, director of postsecondary issues at Center for American Progress, explained that the Scorecard aims to be two things: a consumer tool for college applicants – with bite-sized statistics that officials believe are the most useful for future students – and a much more robust set of data files with many of the details that reporters and researchers salivate for. To begin, head to this link and review the datasets available. Miller encourages reporters to start with the most recent data. If you want comparisons over time for variables such as Pell enrollment, the larger “download all data” is in order. Your next job is to download the data dictionary, which defines the shorthand the datasheets use to mark each variable. Without this Rosetta stone, you’re unlikely to make sense of the roughly 2,000 columns in front of you. Studying the data dictionary may also prompt you to consider data details you weren’t previously searching for, such as information on veterans. Learn why comparing repayment rates and default rates requires some additional crunching. Find out that the six-year average wages column actually captures the earnings six years after students in that cohort entered school, not completed school. Realize that the consumer-facing tool for average graduation lumps completers with non-completers – something the more robust data doesn’t do. Be mindful that the loan repayment rates are for federal loans – and some schools have really high or really low shares of students borrowing Stafford or Perkins loans. Know that some data don’t capture information among graduate-school students or those who took out Parent PLUS loans. 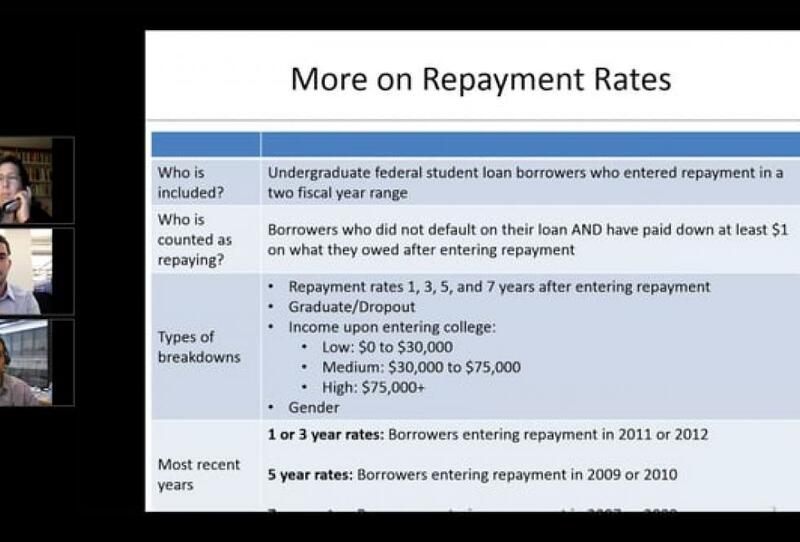 For example, the default rate does include graduate borrowers while the repayment rate comprises only undergraduate borrowers. Be aware that some university systems have only aggregate financial aid and earnings data; individual-campus data isn’t available (Rutgers is one example). Don’t trust Pell completion data: It’s got issues in large part because universities had no compliance-based reason to track this information until maybe recently.